Zoho, the creators of a web-based software suite made up of document, project and invoicing management tools, has launched the availability of its comprehensive webtop productivity products on mobile devices. Zoho previously had basic mobile support for its applications on iPhone and some limited capability on Windows Mobile but now fully integrates Zoho Applications with several mobile devices. 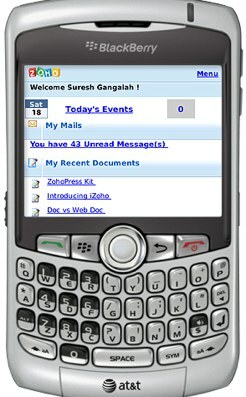 Zoho Mail, Calendar, Writer, Sheet, Show & Creator are now available for the iPhone, Android, BlackBerry, WindowsMobile and Symbian devices. As we’ve written in the past, Zoho is an innovative document management tool, and includes easy access thanks to support for Google and Yahoo IDs and the group sharing across different apps feature. While Zoho has added useful features to its software suite, Zoho is going to have to fight an uphill battle to keep consumers from going towards web-based applications offered by companies with a vast reach (Google, Microsoft, Adobe, etc. ).